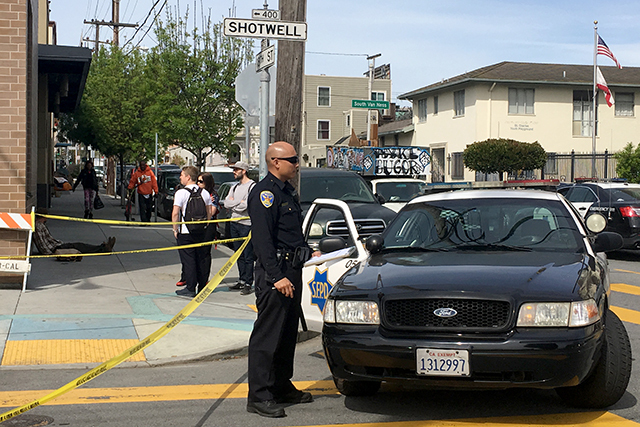 Another witness told Mission Local today that the man police shot and killed Thursday morning at 19th and Shotwell streets never lunged at officers. That comes on the heel of video obtained by the Chronicle that shows the moments of the shooting — though the shooting itself is out of frame. Her statements agreed with what three other witnesses have said but are at odds with the version of events given by police, who said the victim — whom the Medical Examiner identified as Luis Gongora — lunged at them with a 13-inch-long non-serrated kitchen knife. Commander Greg McEachern said police had interviewed 10 witnesses, and presented three who said that Gongora did threaten the officers, according to the San Francisco Examiner. But the new witness, a local resident named Ellen, who did not want to give her last name and lives a block away from the Shotwell Street shooting site, offered a different version. She said she was walking home from Mission Cliffs gym when she saw a police car parked on the corner of 19th and Shotwell. Her statements follow those made by two friends of Gongora’s, a neighbor who posted an account online, and an anonymous source who spoke with the Chronicle. All of them stated that Gongora did not lunge at the officers. Ellen said her view of the shooting was partially obstructed by the car, but that she “never saw the guy lunge at the cops.” Nonetheless, she said, as she rounded the corner she heard officers say “Drop it” twice to a man slouched against a wall. After the officer fired “four to six” bean-bag rounds, the other officers took out their pistols and fired a similar number of bullets, she said. The video provided to the Chronicle indicates there were seven gunshots. Ellen said her mind went blank when she saw “the guy facedown on the sidewalk” and that she walked home immediately. She waited there before going back to the scene to give a statement to police. Ellen’s account matches that given by a homeless couple on Thursday. John Visor and Stephanie Grant said then that Gongora was sitting against a wall after playing with his soccer ball and that he did not understand the officers’ commands as they approached him. The press conference held Friday morning came on the heels of security camera video from across the street provided to the Chronicle that shows the incident unfolded in just 30 seconds, though Gongora and shooting itself are not visible in the video. The video shows three patrol cars drive up Shotwell Street toward 19th Street and park in the middle of the block near a homeless encampment. Three officers exit the vehicles, and the driver of the car in front emerges with an orange bean-bag shotgun. In the video, the officer raises the shotgun within 10 seconds of exiting his car and aims it out of frame toward where Gongora was reportedly situated. Walking on the sidewalk toward Gongora, the officer yells “Get on the ground,” and then “Stay on the ground,” while advancing. A second officer, who exited the car behind him, joins him at his side. The two officers shout “Get on the ground” and “Put that down” as they move toward the man and out of frame. The first bean-bag shot happens out of frame and is followed quickly by three more, before seven handgun shots are heard. Almost all officers are out of the frame except during the final shots, when the first two officers come back into frame. The officer with the bean-bag gun can be seen firing two shots from his pistol. A third officer is well behind the first two throughout the incident and does not appear to draw his weapon, but is out of frame for a portion of the shooting. The Coalition on Homelessness issued a statement with concerns about the shooting on Friday, among them the fact that all commands were issued in English. Gongora was reported to be a monolingual Spanish speaker, and another witness said Gongora did not understand the officers’ commands. In the statement, the Coalition called for changes to police use-of-force policies, including language requiring “minimal” instead of “reasonable” force. “We should not settle for the lowest possible bar: While valuing officer safety, we must also embrace sanctity of civilian life,” the Coalition’s statement read. The statement also called for mandatory de-escalation in encounters with civilians, implementation of a crisis intervention team, no implementation of Tasers, and the collection of data on use of force. Mayor Ed Lee has called for an Office of Citizen Complaints investigation into the incident.